When you deploy your backend API, you deploy it to the project ID of the Google Cloud Platform (GCP) project you created for your API, and you must also specify the App Engine version you deploy to. You specify the App Engine app version on the command line when you deploy your app. 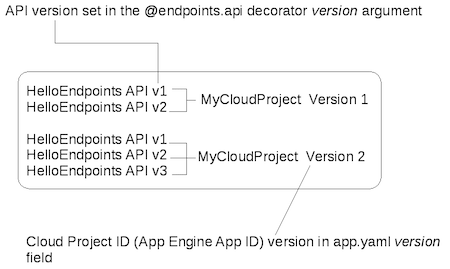 The App Engine app version isn't the same thing as the backend API version number, which you specify in the version argument to the @endpoints.api decorator.